♥ Mama 2 Multiples ♥: Yum Yum Dishes Review! I have been working on losing some weight for a while now. I recently started back into my dance class, and have been LOVING it! And much to my happy surprise, I realized I had lost 10 lbs the other day! I haven't been doing much as far as changing too many eating habits, but seeing that I had lost so much weight in such a short time of starting exercising (dance class), it made me want to pay more attention to my portion sizes and the healthiness of what I eat. I found Yum Yum dishes while searching random stuff on the internet one day, and loved the concept. "I started using a small dish for snacking. As long as I didn't re-fill the bowl, I could never over-snack! In a short time, I was back to my original weight. I thought others might like to try out this simple method of portion control. The Yum Yum Dish was born, a 4 oz. dish that's fun and easy to understand. The Yum Yum Dish is perfect for children, teens, and adults who want to enjoy all their favorite foods in moderation. Not concerned with portion control? Use these hand-painted dishes for sauces, dips, entertaining, and more. A Yum Yum dish is a creative gift for the foodie in your life and a smart addition to any weight loss plan." For my review, I received a 9-inch portion control dinner plate and a snack bowl. I absolutely LOVE LOVE LOVE these items!! The other day for lunch, the kids and I ordered sandwiches. I threw in some chips with them, but instead of eating my normal (unknown) amount of chips, I looked at the service size on the back of the bag, and filled up my snack bowl with the recommended serving size, and once I saw the "Over" on the bottom of the bowl, I knew not to re fill. Of course, I could have refilled it at any time, but there is just something about measuring your serving sizes and portion control that makes me excited and NOT want to re fill my plate or bowl. And, I even felt full for hours afterwards, so it worked great for me! That night for dinner, I decided it was finally time to put my plate to good use. We had steak with onions, chicken flavored noodles, broccoli, and crescent rolls for dinner. I cut my steak up and filled up that section of the place, and filled the remainder sections with noodles and veggies. 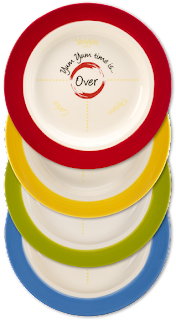 This plate makes it so easy to control my portion sizes! It just felt so great to use this plate, know that I was eating the proper portions of each recommended food group, and when it was gone, it was gone! And, as with the snack bowl, I felt full and healthy! I now use this plate for ever meal, and every time I feel a snack coming on, I use my Yum Yum snack bowl. These dishes are so great for anyone trying to lose a few pounds or just pay a little more attention to your portion control sizes and get a little healthier. When you go to order for yourself, Yum Yum Dishes is offering all readers of Mama 2 Multiples a 20% off discount using the coupon code MAMA. Be sure to use ALL CAPS when using this code, as it is case sensitive. This code is only active until March 26th and is ONLY for readers of Mama 2 Multiples, so hurry and use it before it expires! That is a really great idea! 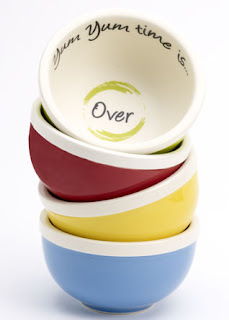 Clever and cute dishes, what more could one ask for? This looks like a great idea and a fun way to help with portion control. The colors are great and it's good to have the reminder without feeling like someone is nagging you to stop eating.